I have been hanging on to this one for ages. The room is a studio, part of a guest house near Brussels (you can see more photos of the property at The Style Files), and the contents of the bookshelves look like they are well used by the studio’s resident. This is a workspace, so there’s nothing particularly cosy about it, but I love its simplicity and functionality. 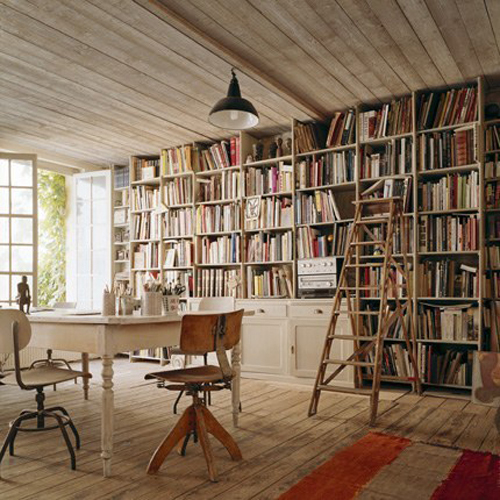 The room also perfectly suits my current summer-inspired desire for laid-back, country-style libraries. I like this one, the pale colours still manage to look warm and cosy with the wood and the rug, the well placed desk, with pots of pens and all good things stationery and the vintage chairs facing the open window bathing all in light. Love the miniature thinker too. I wouldn’t like to dust it though! I love this one. The one thing that would make me nervous would be the rustic floors. Down here that would almost automatically mean bugs of some sort would be hard to keep out. I can imagine a nice comfy chair on the camera side of the room, though. No, not keen on this one. Oppressive ceiling, uncomfortable chairs, and rather untidy shelves, it reminds me a little of a school room. I’d be more interested in what was outside! Don’t like the overhead metal light fitting either. Sorry, this one not for me! I absolutely love this one, Claire; the functionality of it, the purposefulness of the books and table and such, and, oh-how-clever the use of a real ladder to retrieve the books on high! It appears that what was once a factory has taken on new meaning. If I can imagine the photo is being taken from a comfy armchair, then I’m all in! Lovely a light. But I couldn’t relax with a novel on one of those chairs.